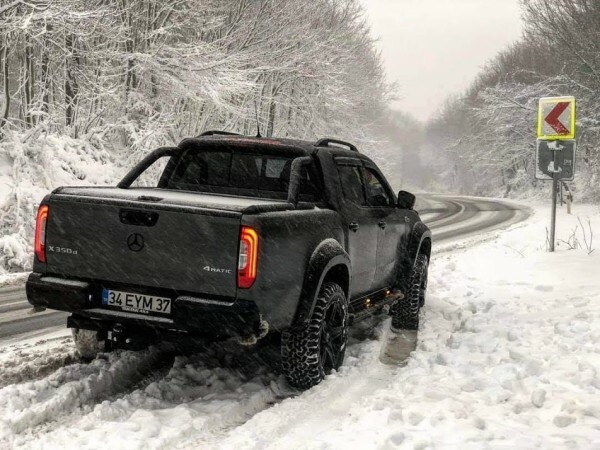 Last year when we interviewed the Mercedes-Benz Malaysia management they stood fast with their decision not to introduce the X-Class pickup truck to the Malaysian market as it did not command a favorable asking price. Estimated at the time to be between RM250,000 and RM290,000 due to high taxes and no possible local assembly. 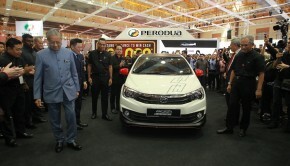 Now, in 2019, with the Malaysian National Automotive Policy 2019 still hanging in the air, Mercedes-Benz is unable to enjoy high sales of PHEV models like the S400 hybrid, C350e and E350e and so to keep their sales numbers high and stay ahead of the competition they will need a fast moving product like the X-Class. Seeing the success of the Ford Raptor at RM199,000, The X-Class could easily be the pick of the rich since the older Defender pickup is sold out and there is no new Defender pickup in sight. 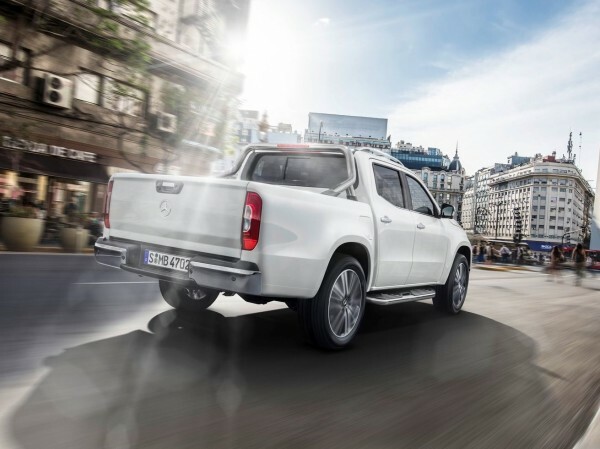 With three design and equipment lines, the Mercedes-Benz X-Class is ideal for a range of different lifestyles and work environments. It fulfils requirements in commercial and private use alike, as well as in urban and rural settings. 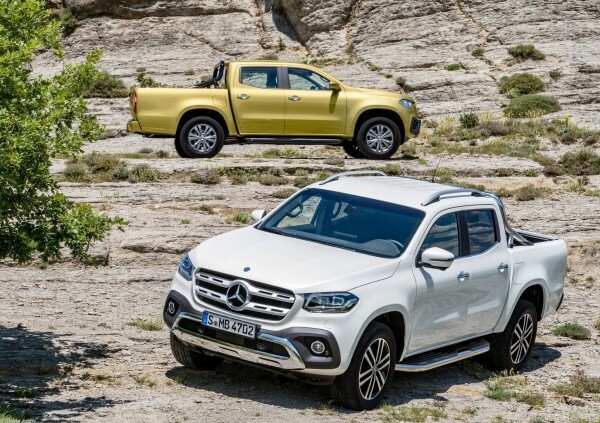 With a payload of up to 1.1 tonnes, the Mercedes-Benz X-Class thus not only appeals to pickup owners who wish for passenger car characteristics in terms of performance, safety, design and comfort, but also to people who have previously always driven a passenger car. 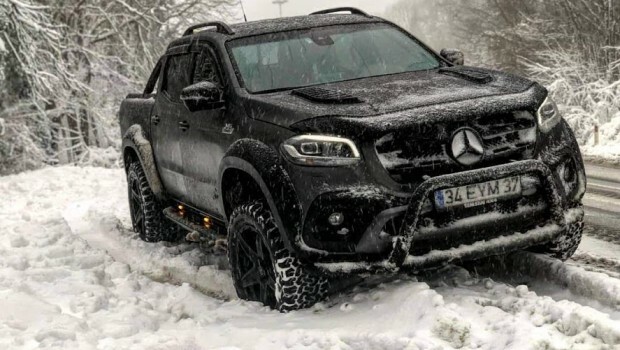 The X-Class is aimed at very different customer groups: land owners, business owners and building contractors with an affinity for premium products, or trend-conscious individualists as well as sporty adventurers. The PURE, PROGRESSIVE and POWER design and equipment lines differ in terms of design, equipment level, functionality and the available drive system variants. Mercedes-Benz has also put together additional equipment packages, providing further scope for individualisation. 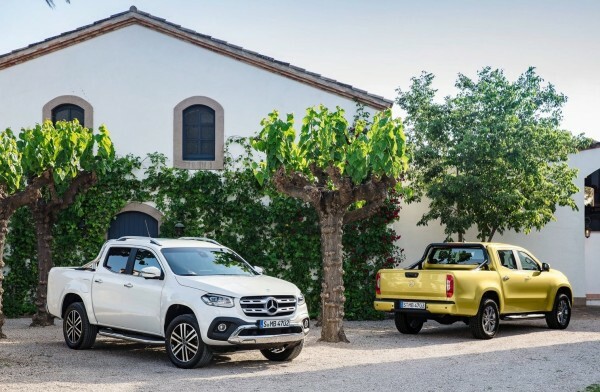 As a result, the X-Class offers maximum flexibility for a whole host of applications – from working on a farm or palm oil plantation to an important business meeting, from a weekend trip with the family to making a powerful impression driving up to a golf club or a stylish restaurant in the city. The PURE basic variant is ideal for rugged, functional use. It fulfils all the demands placed on a workhorse. At the same time its comfort and design make it perfect for visiting customers or suppliers and for private activities. The diesel engine is available optionally with a seven-speed automatic transmission and engageable 4MATIC all-wheel drive. Likewise optional, the Plus Package includes the PARKTRONIC parking assistance system and load-securing rails in the floor of the load bed. 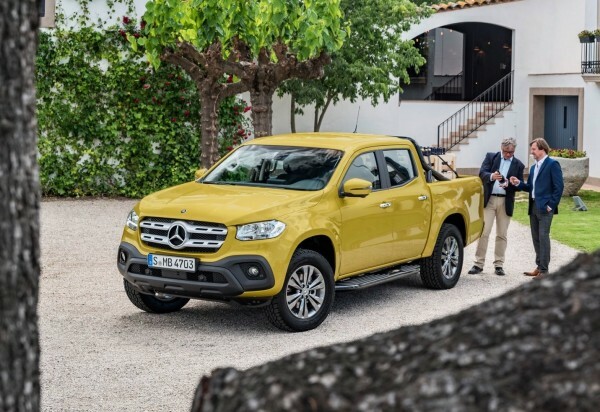 The X-Class PROGRESSIVE is aimed at people seeking a rugged pickup with extra styling and comfort functions – as a calling card for their own business, while also being a comfortable, prestigious vehicle for private use. The four-cylinder diesel engine is available optionally with a seven-speed automatic transmission and engageable 4MATIC all-wheel drive. 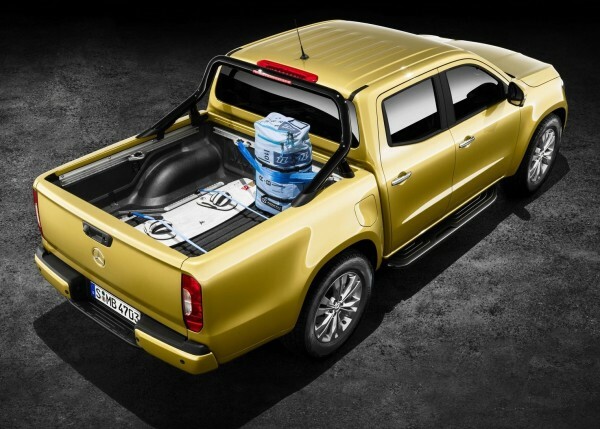 In addition, Mercedes-Benz offers two optional equipment packages for the Mercedes-Benz X-Class PROGRESSIVE. The Comfort Package comprises electrically adjustable front seats with lumbar support, THERMOTRONIC automatic climate control, seat upholstery in ARTICO man-made leather/DINAMICA microfibre, and a stowage net in the front passenger footwell. The Style Package comprises LED High Performance headlamps and part-LED tail lamps, an electrically opening rear window, tinted rear windows, side running boards, roof railing and 18-inch six-twin-spoke light-alloy wheels. 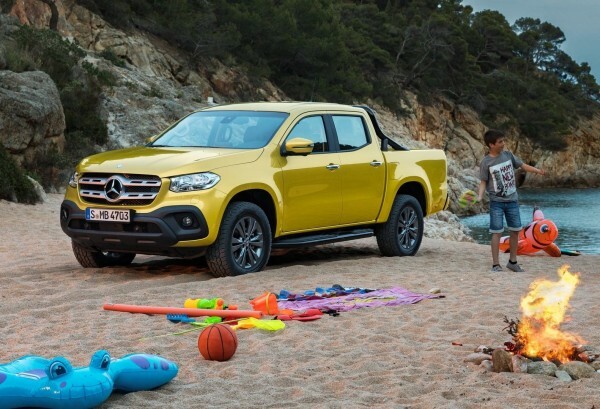 X-Class POWER is a lifestyle vehicle beyond the mainstream – suitable for urban environments as well as for sports and leisure activities off the beaten track. Through its design and high level of equipment it reflects an independent and individualistic lifestyle. The four-cylinder diesel engine is available optionally with a seven-speed automatic transmission and engageable 4MATIC all-wheel drive. 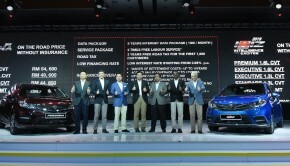 Next year there will also be a six-cylinder diesel engine with 7G-TRONIC PLUS and steering-wheel gearshift paddles as well as with standard permanent 4MATIC all-wheel drive. Furthermore, Mercedes-Benz is offering an optional Style Package for the X-Class POWER. 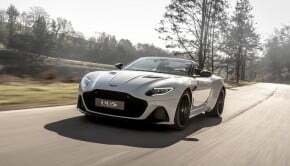 It includes an electrically opening rear window, tinted rear windows, side running boards, roof railing and 19-inch six-twin-spoke light-alloy wheels. In addition to the line-specific packages, there is a variety of optional equipment available as well as a Winter Package (seat heater for driver and front passenger, heated washer nozzles) and a Parking Package (PARKTRONIC parking assistance system and 360-Degree Camera). Mercedes-Benz had an in-house team of designers and developers create an extensive range of accessories especially for the X-Class. These enable the design and functionality of the pickup to be customised to an even greater extent. This range is provided by Mercedes-Benz Accessories and comprises styling, loading and off-road solutions. It will be expanded successively, especially for off-road use. Styling bar – The styling bar gives the Mercedes-Benz X-Class an even sportier and more progressive character. With a diameter of 76 millimetres, the pipes are made of stainless steel – highly-polished or painted black. The third brake light is integrated into the styling bar. This does not affect the standard lighting for the load bed. The styling bar is attached to the load compartment sill and can therefore be combined with other Mercedes-Benz accessories. Sports bar – The sports bar is available in all vehicle colours. With its individual look, it blends perfectly into the vehicle design and intensifies the X-Class’s dynamic and sporty appeal. The third brake light is integrated into the sports bar. The sports bar will be available as from the summer of 2018 – separately or in combination with the roll cover, which additionally secures the load against theft. 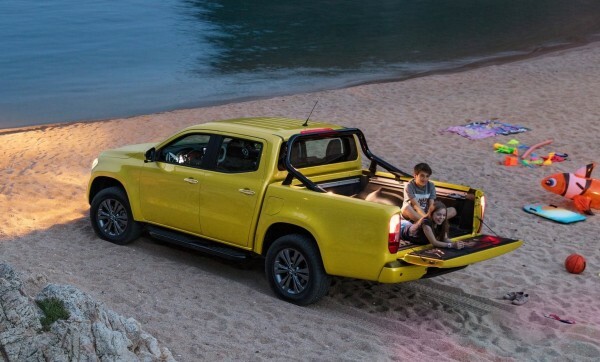 Side bar steel – The side bar with step gives the X-Class an even more rugged character and makes it safer to climb in and out without slipping. Able to bear up to 150 kilograms, the diameter of the pipes is 76 millimetres. The side bar is available in polished steel or painted black. In terms of design, the side bar and styling bar are perfectly matched – for a consistent overall look. The side bar will be available from early 2018. 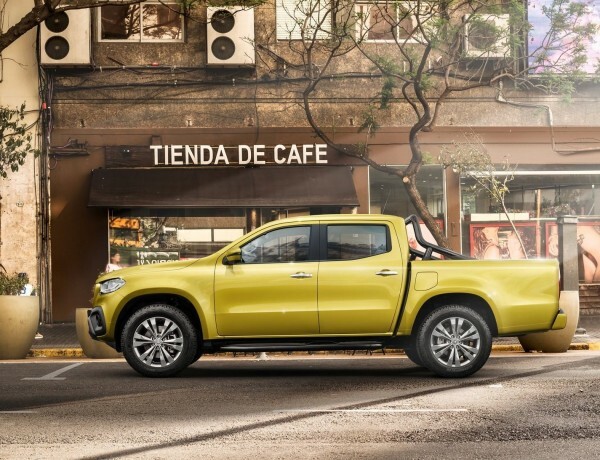 Canopy – Painted in the vehicle colour, the canopy continues the lines of the X-Class’s design, merging with the vehicle body to create a distinctive silhouette. It also increases the cargo volume, protects the load against theft and is watertight, weatherproof and dustproof. The lift-up window on the front passenger side is operated using a pushbutton at the front of the canopy. On the driver’s side there is a pop-out window to let fresh air into the interior. As a result, the canopy is ideal for transporting pet dogs, for example. The rear window also opens using a pushbutton. This renders handles superfluous. All the windows have tinted glass. The canopy is lined on the inside and features LED lighting. The canopy can be provided with roof railing as an option. This matches the vehicle’s main roof railing perfectly. With the roof railing, the canopy can bear a roof load of 150 kilograms. Without roof railing the load is 75 kilograms. Bed liner – The black plastic liner protects the load bed from dirt and scratches and thus makes loading and unloading easier. It goes under the load compartment sill and is therefore compatible with all covers and the load-securing rails. Bed divider system – The moveable partition makes it possible to compartmentalise the loading area to best effect. The partition is made of anodised aluminium and attaches to the load-securing rails. This prevents the load from shifting out of place. 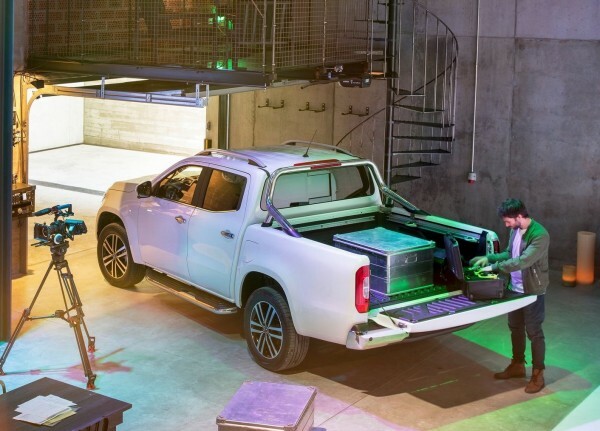 Load-securing rails in the floor – As standard, the Mercedes-Benz X-Class has four load-securing points (PURE line) or load-securing rails (PROGRESSIVE and POWER) on the sides of the load bed. Load-securing rails in the floor are available as an accessory for all design and equipment lines. These conform to the DIN 75410/DIN EN 12640 standard with a maximum tensile force of 400 kilograms per lashing point. Soft tonneau cover – The black soft tonneau cover is a reasonably priced, flexible covering solution. It is watertight, weatherproof, tear-resistant and can be rolled up. When rolled up it can be attached to two loops. The soft tonneau cover will be available with and without the styling bar from early 2018. Hard tonneau cover – Available in the vehicle colour, the hard tonneau cover protects the load against theft as well as from the effects of the weather. It is weatherproof, watertight and dust-repellent. Inside there is LED lighting which switches on and off automatically. A pressurised mechanism means it is easy to open and close. The lockable hard tonneau cover is available with and without the styling bar. Roll cover – The roll cover comprising aluminium profiles protects the load against theft. It is waterproof as well as water-repellent and dust-repellent. It can be fastened in multiple opening positions and combined with the styling bar or the sports bar. Storage box – This roomy, lockable and scratchproof box has a capacity of 156 litres and protects the contents from the effects of the weather and from theft. It is rainproof and easy to clean – including with a pressure washer or in a car wash. Attached to the load bed’s side load-securing rails, it can be positioned anywhere in a longitudinal direction. The storage box will be available from early 2018. Technical Underguard – The technical underguard covers the relevant areas of the vehicle underbody and thus protects the engine and transmission against damage when driving off the beaten track. It consists of three parts which can be removed if necessary. Made from stainless steel which is two to three millimetres thick, it is extremely robust. There are openings to provide easy access to all relevant areas for repairs and maintenance tasks.